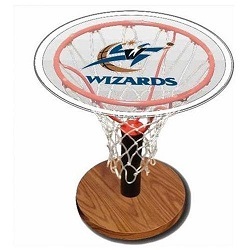 Washington Wizards fans now have table to show off at home or the office. 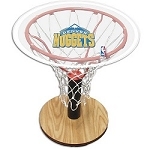 It sports a regulation size rim and has a wide 24" table top. The table is a smooth beautiful acrylic to add style to any room. The 24 inch height means this isn't a coffee table, but an actual table to accommodate chairs. 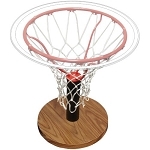 The base is wood grain and includes a nylon net. Enjoy years of use. 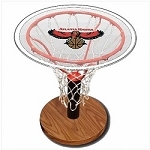 Great as a gift for your favorite Washington Wizards . Generally ships out the next business day and takes about 3-5 days to received. Ships via FedEx from Alexander City, Alabama. Go Wizards! A: These have a 90 day warranty through the manufacturer. If anything arrives damaged or defective we do get it replaced for you. Fast Shipping: Orders for the Spalding 30WAS generally leave the warehouse within 1-2 business days. Delivery Details: This product ships directly from the warehouse in Alexander City, AL. 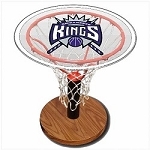 This item generally ships via FedEx and may not require a signature. 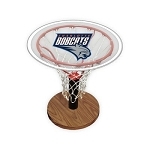 Local Pickup Option: This item may be available for local pickup in Alexander City, AL. If you are interested in picking it up locally contact our customer service for a super cheap pickup quote at 866-308-5484. Dimensions: 26" x 25" x 5"